In constructive response, this essay: (1) distinguishes between “healing” and “cure”; (2) demonstrates what happens via sacramental anointing of the sick; and, (3) explains when this sacrament should be sought. And yet, health regained by curative interventions is said to amount to far more than the mere absence of “this woman’s” cancer. “The World Health Organization [WHO] defines health as a state of complete physical, mental, or social well being and not merely the absence of disease or infirmity.”  Each dimension explicitly recognized in this fairly-holistic WHO definition can be scientifically measured because none transcends temporality. As such, the goals attained, which are truly excellent and thus desirable, are also temporally bound. In Jesus’ resurrected state, His wounds are not cured, not even partially. Herein, Jesus prays to His Father for a scientifically-measurable positive outcome, prevention of lethal crucifixion, an outcome that coheres with the WHO’s definition of health. At the same time, Jesus shows us how to pray when He himself prays with perfect confidence that His Father has His best interest in mind, His ultimate accomplishment of His incarnate mission. In other words, Jesus shows us how to pray for cure while also demonstrating to us how to fully respond to God’s will, God’s gift to us of ultimate healing (eternal beatific union with God). The question for you and me is both simple and frightening: “Do I trust God enough to pray in union with Jesus in the Garden?” If I do, I am well disposed to receive God’s healing (sanctifying) graces via specific sacramental interventions such as Anointing of the Sick, graces that may or may not cause curative effects in “this” situation. Consistent with the fact that healing, as fully appreciated within Catholic thought, transcends temporality, the Church also recognizes key sacraments which, when embraced in well-disposed fashion by their recipient/s, actually bring about such healing and sanctification. Anointing of the Sick is one such sacrament. Anointing of the Sick perfects “the virtue of repentance.”  When a person is anointed, even when he/she cannot confess his/her personal sins unto absolution, God’s Grace effectively: (1) removes personal sin and its after effects; (2) strengthens the sick person’s soul; and, (3) causes great trust in God’s mercy such that the sick person is able to bear the burdens of his/her cross. These effects hearken back to St. Thomas Aquinas’ account of this sacrament. “For him . . . the anointing is directed primarily against the after-effects of sin [punishment],”  after-effects destroyed unto beatific union with God. (B) Dying You destroyed our death, rising You restored our life. Lord Jesus come in Glory. (D) Lord, by your cross and resurrection You have set us free. You are the savior of the World. Even though a patient does not need to be consciously aware of what is taking place during his/her own anointing, waiting until “late in the game” so to speak is dangerous. I have all too frequently encountered patients who are nearly on their last breath when I am called in to anoint them. On several occasions, the call came far too late. We do not anoint corpses. Family members sometimes do not call the priest for Last Rites earlier because they themselves fear death and are superstitious. Others are afraid to upset their loved one who is dying. Some are in denial and may even be guilt ridden about thinking their loved one may die. As understandable as such motives for procrastination may be, Anointing of the Sick is primarily done to help patients grow in holiness (healing as sanctification). Waiting to anoint a patient until “late in the game” is analogous to waiting a dangerously long time to start a patient on a course of life saving cancer treatment. The longer you wait the greater chance that the patient may no longer be able to respond optimally to the intervention. When anointing is done while a patient can still make a good confession and be given Eucharist, the patient is able to consciously engage in what takes place and can come to deep peace even in the midst of such frightening circumstances. Strong emotions will almost certainly arise. Tears will probably flow. Do not fear. Beyond any measurable distress, faith and love of God are deepened. Finally, Anointing of the Sick is not only used for patients who are imminently dying. For example, patients who are going to have surgery which they reasonably and confidently expect to survive face dangers inherent to surgery itself. 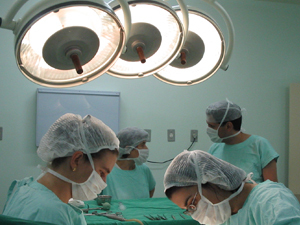 Although very rare, such patients sometimes fail to survive their surgeries or their post-operative recovery periods. By seeking out their parish priest prior to going to the hospital for surgery, patients can make a good confession and receive Eucharist followed by anointing, an excellent preparation for whatever comes to pass. Concisely put, these serious surgical events become occasions for the special sanctifying Graces proper to these healing sacraments. Whether one legitimately fears probable death or one is going for a common but serious surgery reasonably expected to bring cure rather than death, one would do well to seek out Anointing of the Sick for the good of his/her own sanctification. In cases in which one is guilty of sin, one should also have his/her confession heard unto absolution and receive Eucharist. Doing so gives a person all the reason in the world to be at peace. In the end, rather than inappropriately treating these sacraments of healing as quasi “last-ditch placebo-type ‘holistic’ palliative interventions,”  viewing them superstitiously, or not thinking of them at all, one should begin with them and continue to practice them and other prayer forms insofar as one is capable throughout one’s course of treatment even, and perhaps most especially, when cure is probably impossible. Fr. Christopher M. Saliga, O.P., R.N. and Fr. Carlos Quijano, O.P., “Spiritual Care in Hospital Policies: Incorporating Sacramental Interventions,” Ethics & Medics 32.2 (February 2007): 3. Jn. 20:27 (New American Bible). Mk. 14:36 (New American Bible). Coleman O’Niell, O.P. Meeting Christ in the Sacraments. (New York: Alba House, 1991), 287. Ibid. O’Niell cites the Council of Trent in recognizing these effects of sacramental anointing of the sick. Pastoral Care of the Sick: Rites of Anointing and Viaticum (New York: Catholic Book Publishing Co., 1983), 242. O’Niell, O.P. Meeting Christ in the Sacraments, 288. Jn. 3:16-17 (New American Bible). Fr. Chris currently serves as the University Chaplain of Walsh University in North Canton, OH and as an ethics consultant to The Dominican Friars Health Care Ministry of New York. Commensurate with the goals of these ministries, he continues to speak at a variety of schools, health care institutions/organizations, and Church groups, and continues to write concise essays, reflections, and case studies on a variety of topics. What Role Does Virtue Play in Catholic Bioethics?